When Is The Best Time Go On A New England Fall Foliage Tour? With the weather being so nutty nowadays, it's hard to pinpoint when winter or rainy weather is set to start, which is why it's a good idea to use a travel agent as they are always in the know about when to and when not go to a particular destination...This year for example, Fall Foliage Peak Times begin around late September in northern Main, which is the northern-most state in New England; however, you also have to account for southern-most states like Massachusetts as well. 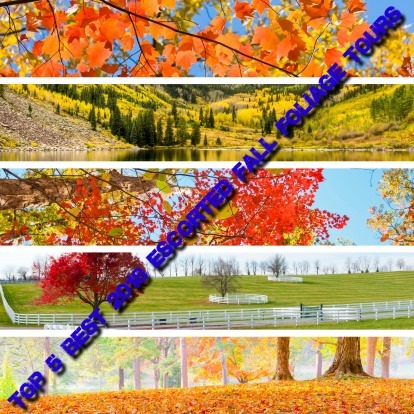 This means the best time to start your 2018 Fall Foliage Tour in Boston is around the first week of October; this way you get to experience Fall Foliage in Massachusetts, Vermont, and New Hampshire as well! 5). Insight's "New England's Spectacular Fall Foliage"
4). Gate 1's "Classic New England Fall Foliage"
3). Tauck's "Grand New England"
2). Globus' "Classic Fall Foliage"
1). Caravan's "New England Summer and Fall Foliage"